The ABC interview was a bit disappointing. It turned out my story was just the frame for a call-in chat-back about what local thing you've stumbled upon in some surprising place on the other side of the globe. I had a few minutes to tell the story; then they just went to callers. The producer said they would try and find out more about it. But one week later – nothing – and I realise I was just a blip in arvo radio chat-back. So, here I am listing my leads. The mural is signed 'AiR'. A simple Google search doesn't turn up much, except there's a gallery in Bergen – USF – that runs an Artist in Residence program they call, for short, AiR. I don't think an artist would sign under a program name, but maybe it's worth an email. The Bergen School of Architecture – it's on their wall; maybe they're in on it? I need to send them an email. "I know a connection ! Maybe... My mother Patsy Adam-Smith befriended the Captain (Torsel?) of the Norwegian ship (Norsel?) that ANARE used in the late 1950's that was based at Bergen or Tromso. They came for a number of years for Antarctic resupply trips in summer. Jeg Elske dei !?" I know of Patsy Adam-Smith. She is one of the few Australian historians I do know. Primarily because of her 1978 book The Anzacs which has proudly resided on mum and dad's display bookshelf in the lounge room for all the years that I can remember. It is so deeply planted in my memory because it holds the twig of a story from one of the branches of my family tree. Namely, my great-grand father – Private David McGarvey fought in the Battle of The Neck at Gallipoli, and was one of the few to return from going over the top. But this information from her son... I didn't know what to do with it. I've never studied journalism. I don't know how to research stuff. I Google the names and translate the last sentence into English: "I love them !?" – What does that mean in this context? And nothing seems to help me with my mystery – not Captain Torsel in the Norsal counting dorsal fins through a port hole – this is no portal into knowing; there's no morsel of a crumb to follow here! "see website www.bartbergen.no it is a street art (in norske, "gatekunst") collective; i have emailed and asked how come the iconic image was drawn. They probably downloaded image and thought it was interesting. Don't anticipate any allegorical meaning; the Norwegians did treat the Sami almost as badly as whitefellas treated blackfellas including destruction of language." This I can follow up. But the website he posted isn't right – it's all about Interior Design. From previous Googling I'm thinking, maybe, he means this other site I found called Mot Veggen, meaning Against The Wall, which features street art in Bergen. 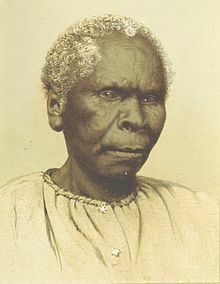 I return there, and begin another, more thorough, trawl through the images – scrolling and scrolling, looking from Truganini, looking for her face looking back at me through screen and history. But no... I can't find her. 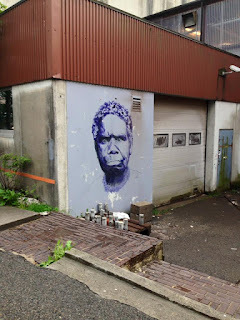 I do a quick search of Facebook and find there, a Bergen street art page – again, I trawl through the images; again, scrolling and scrolling – straining my eyes; stretching thin my hope; and again, no... I can't find her. Here at least, I post a query; and let it rest; awaiting response. Tom: You should talk to my brother-in-law Michael. Me: Yeah, Michael, he was going to Norway wasn't he? Tom: Yeah, Bergen. But he's back now. Me: Bergen! Really? I met him briefly at your Bucks night – he was friendly. Tom: Yeah, he can make a friend of just about anyone. Although he did say that he found it hard in Norway; they all seemed to have quite tight friendship circles. Me: Yeah, I've heard that a few times now, from a few different sources, and with different connotations. At one extreme, they're aloof and isolationist; and at the other, they're just private and self-contained. Tom: Maybe the weather's a factor – having to be more self-sufficient and introverted particularly suits winter. And Norway has a lot of that! Tom: Michael was mostly studying, but he also worked at a newspaper. I reckon he might be able to connect you to the right people over there. And he'll be at my party on Friday – catch him then!